The metropolis on the waterfront: the sea, Elbe river port, canals. Hamburg is a city of water. Finally there is a way to experience this feature immediately habitable and also to bring the holiday mood in everyday life: Living at Victoriakai bank in Hamburg. Stay exclusively in the water and still enjoy full comfort. Plus on a generous living space of 117 m². 60 m² Skydeck You can make your dream of well-being on the water come true. Enjoy this view from the Skydeck, from which you could also throw the Angel into the water. Space way adjustable floor heating. Private floating dock system with the target. A wonderful, warm and comfortable place to stay in Hamburg. Well equipped kitchen; big, comfy beds and well located. Would love to stay here again, especially in the summer so we could take advantage of the upper deck. Fabulous host - thank you Karsten. Awesome property. Close to the trainstation. Quiet area. Private and just a really neat place. Owner was very friendly and took great care to explain the property and the city to us. I highly recommend this place. You won't be disappointed. Extremely nice place and very nice and welcoming host. You will not be disappointed by this place. New, spacious, big roof terrace, close to metro station 4 stops away from the harbour environment. We went 4 friends from Denmark for a weekend getaway, and we all agreed - it was GREAT! The host was there exactly on time as agreed, and he was extremely nice and helpful. The place is amazing. The houseboat was beautiful. It was very clean, well kept, and peaceful. The metro is a short walk from the house boat and just a few stops away from the waterfront. My husband and I enjoyed our stay very much. We stayed here with a group of 4 belgian friends for 2 nights. The houseboat is brand new, spacious and well equipped. The survival kit (product for dishwasher, bin liners, salt & pepper, toilet paper) was present, which is considerable. The beds are very confortable. The location is good, not far from 2 train stations (10 min walk). The owners Harald & Dagmar are very kind and attentive (explanations for the closest supermarket, bakery, etc). They offered us to check-in earlier and check-out later than usually (the houseboat wasn't occupied of course). We highly recommend this property. I stayed here with a group of my colleagues for 6 nights while we attended a conference at the CCH. The houseboat was brand new, spacious and immaculate. The air bed in the huge living room for the 5th guest was high quality and super comfortable. The location was ideal, situated on a picturesque river and not far from two train stations (~8 min walk). Harald went above and beyond what was required to make our stay comfortable, even offering my colleagues a lift to the airport when they departed. I highly recommend this property. 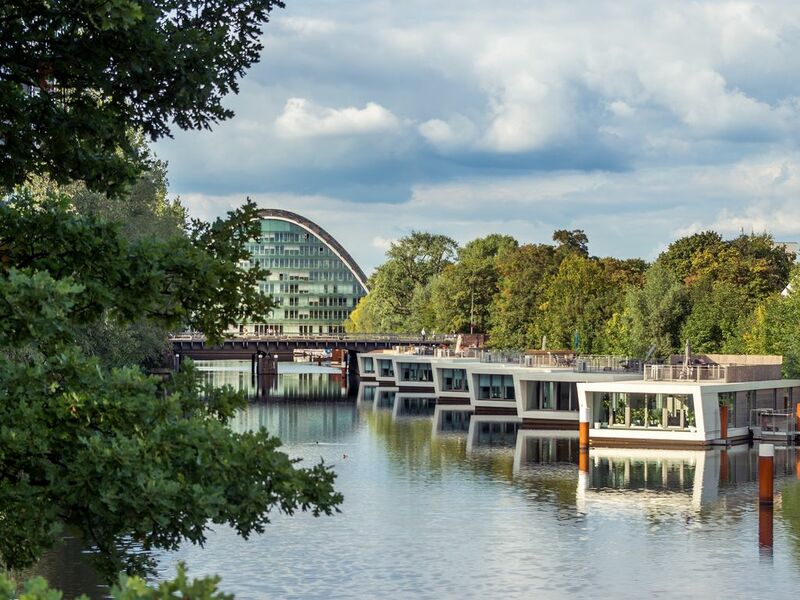 centrally located in Hamburg, on the water in the canal, surrounded by water plants and birds, all inner-city attractions within easy reach on foot or by bike.